Breakfast are the most prime meal of the day, due to the busy schedules of the day we are so preoccupied with days proceedings ,meetings and all that stuff ,we somehow don’t give importance to this meal .However ,if you eat a proper breakfast ,it gives the required energy for the hardships of the entire day .I somehow believe in having a balanced breakfast throughout the week ,for that I may assemble the ingredients that are currently in my pantry , and sometimes a little bit of planning also . Here is 3 ways I prepare our morning breakfast and on weekends we indulge in some heavy Pancakes or Noodles with fried vegetables. 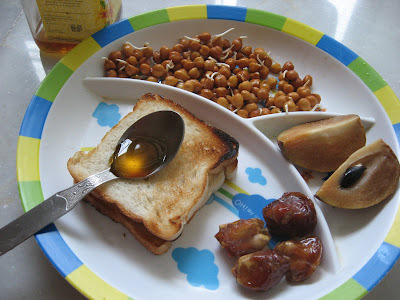 1tbs of Honey - honey is a good source of minerals ,iron and vitamins and heat energy also, Old folks recommends use of honey to ward off cough and cold . ½ cup of sprouts – Proteins –we like Bengal gram sprouts but green moong dal can also be good in the above category , sprinkle some salt and black pepper ,we also add sometimes chopped tomato and cilantro also . It takes 2 days to completely get the sprouts , soak them overnight in water in a vessel and the other day discard the water and then keep them in other vessel covered ,the other day you can see the sprouts coming out nicely . 2 slices of seasonal fruits - Vitamins /Minerals – The above fruit is chickoo .An apple or Pears works fine .Infact remember an old Saying – An apple a day keeps a doctor away , stick to that principle . 4 dates - Vitamins and Minerals – again a good source of calories. Sometimes when dates are not available we include 3-4 cashews or almonds in our breakfast also . Since Manasi is looking for a complete vegetarian meal ,I have skipped that .But a poached egg adds to the nutrients of entire package . 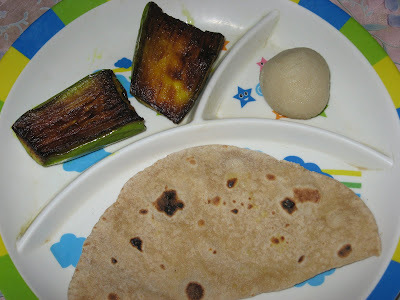 Talk about breakfast so ,how can I forget Traditional fare of Begun Bhaja and Luchi ( my little daughter’s favorite dish ) follow this recipe for making luchi . Luchi Recipe . Since Luchi is fried in oil ,we avoid that and I make rotis/chappati instead of luchi .Genenerally I rub little bit of low fat butter over each rotis ,but my health conscious Hubby doesn’t like that either . 1-2 brinjals / Eggplant - cut and marinated with turmeric powder and salt . mustard oil for frying . Heat up oil in a kadai or heavy bottom pan ,gently release marinated brinjals into the oil .Fry them at low covered ,this way it gets cooked with little oil, flip the side in between .It will take 3-4 mints to fry them . 1-2 cup of whole wheat Flour – a good source of carbohydrate . Knead the atta /flour and make a dough ,I generally make the dough in nights and store I refrigerator ,so that I can save some time over the morning . A Bowl of fresh Curd/yogurt – rich source of protein and specially good during summers. Then add turmeric powder, red pepper powder , salt ,Bengal gram and little bit of water . Cover and cook for 5 mints Meanwhile wash the poha /flaked rice with water and sieve it in a colander or generally I prefer with my hands , it makes things easy for me. Add them with the prepared cooked potato/onion gravy and fry at low for 2-3 mints . Sprinkle with cilantro and serve . If you want to follow a healthy lifestyles you can check this article Healthy Lifestyle . Wow, that's a great array of dishes! Looks so delicous. Perfect for WBB. Wow, wonderful breakfast ideas!! I envy you for that chickoo. It has been ages since I have eaten a decent chickoo!! Nice entry for WBB. its one of my fav too .. 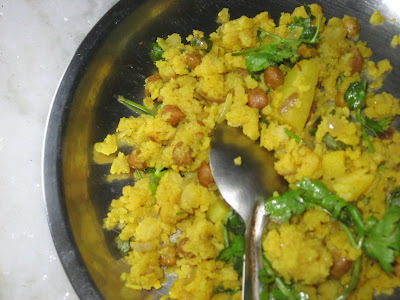 Balancing the ingredients is must for breakfast .I generally try to plan in advance about the Breakfast and other meal for the day ..
aami hope kori je tumi enjoy koro eyi meal ideas golo .. ..chalo good u liked it .